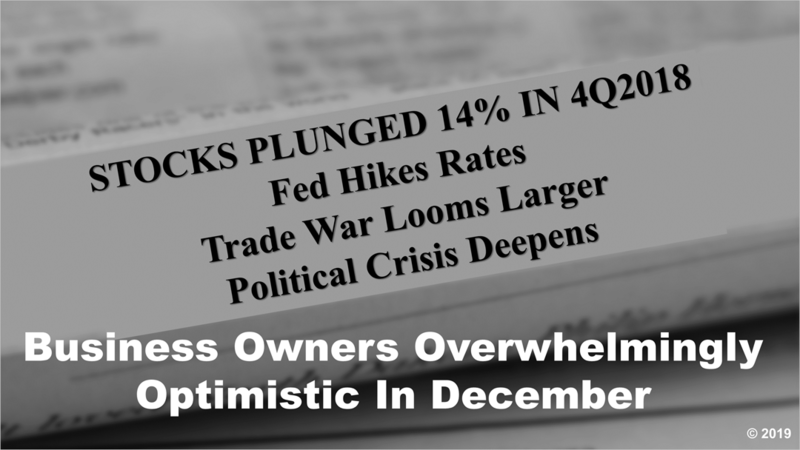 While the stock market plunged in December and headlines turned grim, small business owners overwhelmingly remained optimistic about the economy and business conditions. 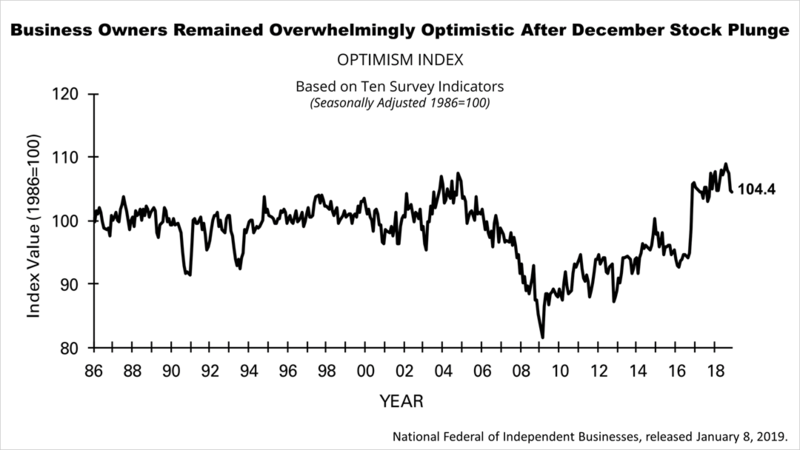 The National Federation of Small Business Optimism Index remained basically unchanged in December, drifting down by just four-tenths of 1%, to 104.4, amid the worst December since 1931. Stocks lost 14% of their value in the fourth quarter and it was the worst quarterly loss since 2011. The Fed was sticking with its plan to hike rates, the political crisis in Washington was making new headlines daily, a trade war with China loomed, and uncertainty blemished Europe's economic growth outlook. 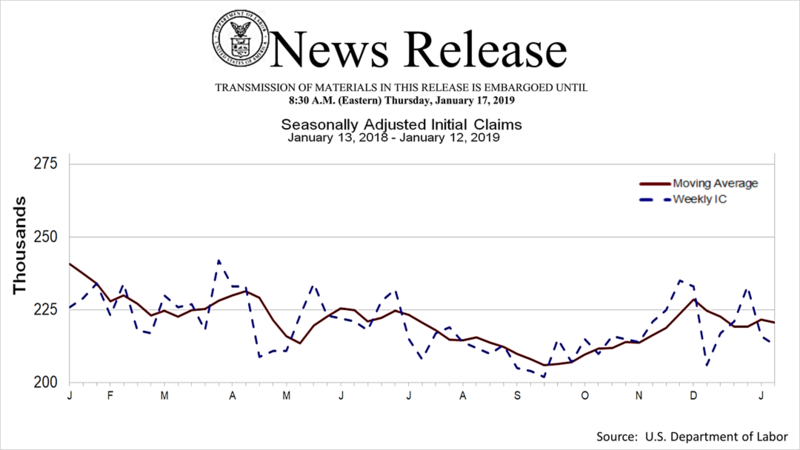 Nonetheless, in the week ended January 12th, the Department of Labor's advance figure for seasonally adjusted initial claims for unemployment was 213,000, a decrease of 3,000 from the previous week's unrevised level of 216,000. The four-week moving average was 220,750, a decrease of 1,000 from the previous week's unrevised average of 221,750. On the heels of last week's stronger than expected job-creation report for December, this reinforces a strong employment situation, and jobs fuel personal income of America's consumer economy. 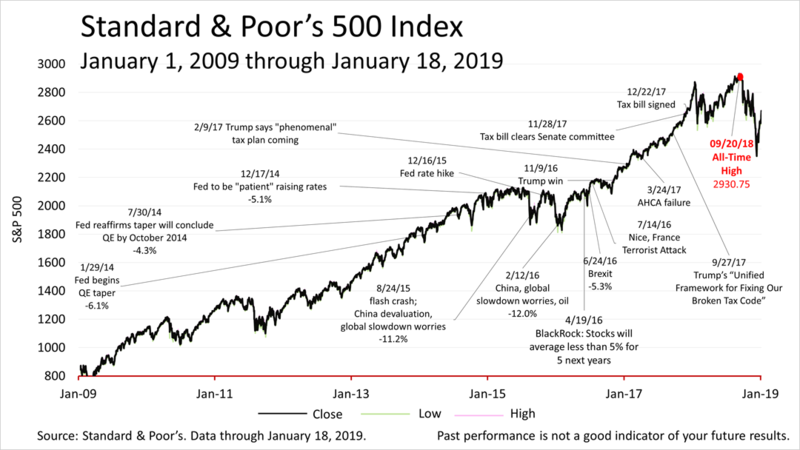 The Standard & Poor's 500 — a key growth engine in a broadly diversified portfolio — closed on Friday at 2,670.71, compared with 2,596.26 a week earlier, extending a rebound from the 19.8% plunge from September 20th's all-time closing high to the Christmas Eve closing low of 2,351.10. Please let us know if you would like a report summarizing the 4Q2018 financial and economic conditions. Signs of a change in investor psychology flashed brighter, as stock indexes on Friday edged closer to all-highs of September 2018. Securities offered through Royal Alliance Associates, Inc., member FINRA/SIPC. Insurance and investment advisory services offered through Phase 3 Advisory Services Ltd., a registered investment advisor not affiliated with Royal Alliance. © 2019 Phase 3 Advisory Services, Ltd.. All Rights Reserved.